What does a typical rebuild include? New Nylock nuts on Lift Ram, Tanks Studs, and Pump Studs. Hone Lift Cylinder to remove rust. Dismantle and clean motor (E-47 only), check for worn parts and corrosion. Put Coil wires in loom. Replace Coil nuts with Brass nuts, using Neverseize and capping them with clear silicone. New Ground Bolt, Tooth Washer, Motor Nut(s). New Fill Plug / Vent. Seal Motor Bolts on E-47 units per Meyer Service Bulletin. 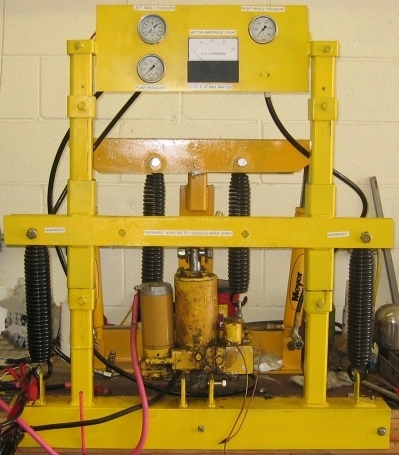 Test all functions on our Plow Pump Test Stand, and/or the Meyer TC-200 Computerized Test Stand based on OEM Specs. Some other special details we won't share here, but will be glad to point out in person, in e mail, or over the phone. My pump was working fine when I sent it in, why does it need additional parts? Just because your pump was working, does not mean that everything is fine. These units do continue to work with defects. Once here in our shop, we will find them. Your unit will not leave with them. Honestly, if you don't want the rebuild done properly, please send it someplace else. We are not being arrogant, it is just that we do it right the first time, or we don't do it at all. Experience has taught us that neither of us will be happy if the job is not done properly. We don't "throw parts" at every unit that we work on, we replace what needs to be replaced. What is the average total cost of a rebuild? This is very hard to say with any certainty. On average, in season, most E-47/E-57 rebuilds will run about $400. They can go as high as $600 or $700 sometimes, or as little as the cost of a Seal Kit, Shop Supplies, and Fluid plus the labor rate in effect at the time of rebuild. Keep in mind the replacement for the E-47, E-57, and E-60 units is the E-58H which has a 2009 - 2010 List Price of $1716.30. Now you may be saying to yourself that you can buy a rebuilt one cheaper on eBay. Yes, you can, but they are definitely "buyer beware" units. You don't know what you are getting. We buy cores on eBay from time to time, and there is a lot of junk out there. At least with a proper rebuild, you know what you have. What is the Standard Labor Cost for a rebuild? Additionally, when you send your unit in, and the ground bolt is snapped off, or one of the studs is stripped, we will remove the snapped bolt, we will install a heli-coil to repair stripped threads at no additional cost. The same holds true for snapped motor bolts, which is pretty common, we will get the broken bolt out, and if necessary, repair the threads at no additional cost. 99% of the time we CAN get out a snapped bolt, we will do everything we can to get it out, but sometimes it is not possible, and a part has to be replaced. We do our best to prevent additional parts expenses! We use a nutsplitter to remove Coil nuts on top of the valves to avoid snapping off the studs. When we rebuild a unit, and find out the Sump Base is bad once on the test stand, the entire unit needs to be torn down again to replace the Sump Base. We do NOT charge additional labor in this case. Any parts found to be bad after rebuilding, and once on the test stand, we do not charge any additional labor to replace them. Our price includes ALL the labor associated with rebuilding the unit sent in. What are the average shipping costs to and from your shop? Typically shipping via UPS Ground is about $35 - $65 each way. When we ship a pump we add about 4 pounds of packing material to the weight. DO NOT USE "PEANUTS" to pack your pump for shipping. Use a sturdy box, the stronger the better. Peanuts allow the unit to move around and end up at the bottom of the box unprotected. Bubble wrap is better than peanuts, and bubble wrap and balled up and crumpled pieces of brown kraft paper is even better. We re-use packing materials as often as possible to recycle, and keep costs down. BE sure to double up, or triple up cardboard inside the walls of the box where the lift ram will press against the wall, and the Acorn nut on the side. Pack the unit securely so it can't move around in the box to help prevent damage in shipping before it even gets to us! Why do you want me to leave the hose and/or couplers on my unit when I send it in? Because once your unit is rebuilt, we need the unit to have couplers on it to put it on our Test Stands. If your unit arrives with no couplers on it, we will install new pin type couplers, and an extra set will be included for the plow side of the system as well, and you will be billed for these two coupler sets. E-47 units typically have a hose with a male coupler on the end, and a 90� swivel elbow with a female coupler half on it threaded into the PA Block.. We will contact you before installing these parts, but again, the unit must have couplers on it to test it. What is the typical turn around time on a pump I send in? In the off season there is no rush, it may take months depending on work load and priority in the shop. Rebuilds are filler work. We get them out as fast as possible. We send updates and questions to you via e mail, so if we send you an e mail, and you don't read it for 3 days, that will delay the whole process. If our e mails go to your spam folder, that will delay things. Your pump will be put to the side until we hear back from you. We will start on the next pump in line. We use e mail because it might be 2 am when we find a problem and need your approval to continue. We can also send photos of what we find. All communication is documented. We already spend way too much time on the phone during normal work hours So if your unit is here in our shop for a rebuild, be sure to check your e mail at least twice a week, and don't forget to check your junk mail / spam folder. Why do you want me to pay using Pay Pal? Credit Card processing fees. We get hit with a higher rate to process credit card phone sales. Especially with these new chip cards. Pay Pal gives us the same rate we get when we swipe your credit card here in our shop. Also, we do not accept Discover or American Express for payment in our shop. With Pay Pal you can pay with Visa, MasterCard, Amex, or Discover, and even with an Electronic Check. It offers you the most flexibility, and you don't have to register for a Pay Pal account to pay us unless you want to. You just need an e mail address for us to send you the invoice through Pay Pal. How do I flush my Angle Rams while you have my pump? These two videos we uploaded to You Tube should explain it well. Why do I have to flush my Angle Rams while you rebuild my pump? Because the pump unit itself only holds part of the hydraulic oil in the system. The whole system needs to be flushed when installing a rebuilt pump. Otherwise water and debris in the rams will contaminate the pump the first time you hit the angle button. How much does it cost for you to paint my pump while you have it there? The cost of painting your pump is $85 for E-47/57 units, and $100 for E-60 units. It also includes new decals. You may think that price is high. Our shop hourly rate is $105 / hr and painting your unit takes over an hour. Yes, yes it does. So you are actually getting a good deal. ALL parts are bead blasted. We do not paint whole units. The Motor and Coils are not on the unit during painting, they are painted separately. This allows for MUCH better coverage of the entire unit. We also have a private stash of Genuine Meyer Primer (no longer available from Meyer) that we use, in addition to Genuine Meyer Sno Flo yellow. We do NOT paint Dust Caps, it will not look like we dipped your pump in a bucket of paint when it is done. It will be a better job than when it left the Meyer factory, because they were notorious for drips and runs everywhere and they painted the units whole, even the rubber Dust Caps! The E-47 and E-57 units had hardly any paint in between the Motor and Tank. Most units start rusting there first. Painting the Motor separate allows for excellent coverage as we already said. What are the most common parts you find that need to be replaced during the rebuild process? The C Valve due to it being swollen, and the Crossover Relief Valve. Other common parts include Couplers, Filters, rusted/pitted Lift Rams, and motors. Why do you use Pin Type Couplers and not the Ball Type? We have had a lot of problems in the past with Ball Type Couplers. They ended when we switched to Pin Type Couplers. Pin Type Couplers are not cheap. They are more than double the cost of Ball Type Couplers, but they are more than twice as reliable too. We often have units come in with cheap Ball Type Couplers on them. Often, these Ball Type Couplers are only rated at 3000psi working pressure. The Crossover Relief Valve on E-47, 57, and E-60 units is set at 3800psi. That means that when you strike an immovable object with the tip of your blade, the Crossover Valve will not open until 3800psi is exerted against it, that is 800psi OVER the rating of most Ball Type Couplers. Then you have problems where the plow gets stuck to the left, or the right. This is often due to the Ball Type Couplers being "bad" (damaged). Once damaged, they tend to act as a check valve allowing fluid to flow one way, but not the other. The Pin Type Couplers we use are rated at 4000psi working pressure. What if I decide not to have you rebuild my pump after you take it apart, or get half way through and find an expensive problem? In that case, you will be charged for all parts installed up to that point. You will be charged for all shop supplies used up until that point. You will be billed hourly for the work performed up to that point. Shop rate is $105 per hour (as of May 2016). You will be charged for shipping the unit back to you in its current state. We hate to have this happen, but some problems cannot be found prior to the rebuilding process. While we have your pump, you need to flush your Angle Rams. We posted two videos on You Tube to better explain how to do it. If you want specific parts changed, such as the motor, coils, and valves, just let us know. We normally will only replace them if they need to be replaced. New paint and decal* is optional. New Couplers are optional. New Hoses are optional. *At this time only E-47, E-57, and E-60 decals are available. Availability varies. We are located in Northern New Jersey on Route 94 in Hardyston, NJ in the Recon Group building, next to Bins & Bays and the Swing In Deli. 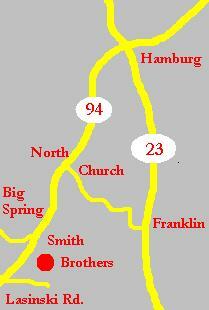 Less than a mile from North Church Road, almost directly across from Big Spring Road. * Plus any parts. All pumps will need a seal kit and fluid at minimum.